Daily Mining Gazette file photo Last year’s Pigs n Heat Benefit hockey game enjoyed record attendance, said Houghton Police Lt. Nick Roberts, who is one of the organizers of the event. He is hoping for another record attendance this year. 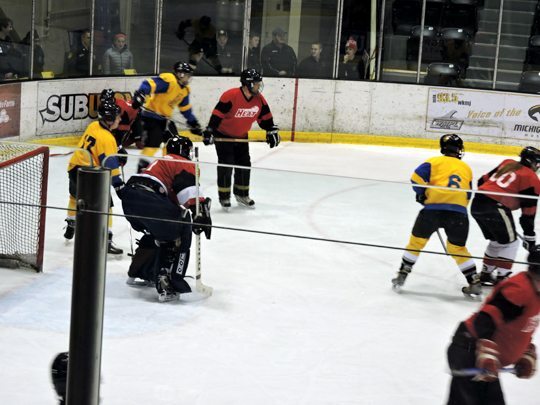 HOUGHTON — The annual Pigs n Heat benefit hockey game between local police and local fire department members is returning for yet another year. Lt. Nick Roberts of the Houghton City Police said the game is scheduled for Saturday, Feb. 3 at the MacInnes Student Ice Arena in the Student Development Complex at Michigan Technological University. Roberts said there will be cash prizes, raffles, and food available, along with all the fun people have come to expect. Tickets are available at the door, and in advance from the Houghton County Sheriff’s Office, the Houghton City Center, local law enforcement, and volunteer firefighters. Tickets are one for $3, or two for $5, and game tickets automatically enter the holder into a drawing for cash and many other prizes. All proceeds will benefit the Copper Copper Country Police and Fire Relief Fund, which aids the victims of fire, crime, and other emergencies.